Tailor the power of learning by doing to the scale of your organization. We will contact you in the coming days to show you around our product. Can't wait? Easily track your team members' progress and see how their skills evolve over time. Enterprise customers can monitor data science development through advanced reporting and stats on every employee. Assign particular courses or chapters, and see who finished on time and who missed the deadline. Enterprise customers can create custom tracks to further tailor and scale their development programs. With your organization's dedicated leaderboard, every member can view and compare experience points gained, courses completed, skills acquired, and more. They'll have fun attaining new badges and rankings—all the way to the top of the leaderboard! How eBay scales R training for a global workforce. How Harvard prepares students using DataCamp. Building data literate teams at Bci. Enterprise plans start at $499 per license per year. Get in touch with our sales team to learn more about our volume discounts and multi-year rate plans. 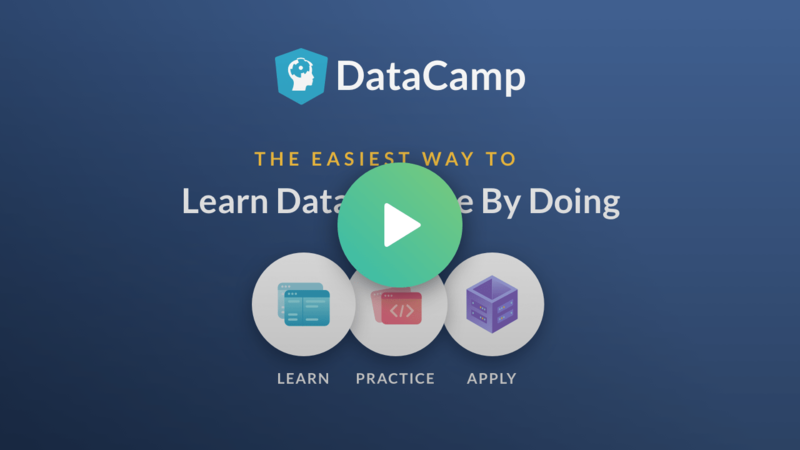 DataCamp offers interactive R and Python courses on topics in data science, statistics, and machine learning. Learn from a team of expert teachers in the comfort of your browser with video lessons and fun coding challenges.